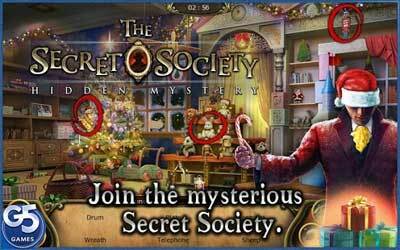 You can test how sharp the sight of your eyes by playing The Secret Society APK 1.20. This challenging game has simple game play. All you need to do is finding hidden object in a picture. However, you need to be careful not to find the wrong object. The setting of the picture is changing depends on your progress. Although it looks like a puzzle game, the storyline puts it under the Adventure Game category on Google Play Store. Besides looking for hidden object scattered all over the picture, you should also protect sacred artifact. The storyline becomes more interesting since you need to complete several quests in enchanting location. This game brings you as a member of secret society. The society is a group of people who works in shadow to find hidden objects and sacred artifacts. You have ability to teleport into a certain place through a magical realm. At the beginning, the elite member of this group is somehow missing. Since he is your Uncle Richard, you need to do everything to find him as soon as possible. You might feel depressed when it starts. However, with special power, you have the ability to find clues and him. The society is in a grave danger of outside treat. Combine the hidden object and complete the mission to protect the society. This addictive game consists of more than 2500 different quest that you can enjoy. The setting used takes place in 25 enchanting place over the world. In those places, you will be able to find an interesting character that helps you to keep in the storyline. It also features mini games in form of puzzle that you can play to reveal the mystery. You can save your progress by connecting your game to Google Play Game application. The Secret Society for Android involves in-app purchases for those who want to get special privilege on your mission.